I discovered that one of my work associates in the UK is a passionate cook and visited a cookery class during one of his holidays. I was very curious, since I have been playing with the idea of doing it myself. I thought his week in the class passed with lots of laughter and lots of great cooking and was surprised to hear that the action in the kitchen was done in a very pleasant atmosphere and since people took the cooking very seriously it was almost reverential. Wow! Based on my attendance at two cookery schools* in England – one in the south and one in the north – I would really recommend the experience. Whether you want to learn new kitchen skills, try out new recipe ideas – or even just take a mental break from work the format of the one day courses offered seemed very well designed. I was really surprised by how much the Chef instructors can teach you in a day – but it is quite tiring and I noticed that some people who were on a week’s course started to want a break by the time Thursday evening came. With regard to recipes the biggest discovery for me was the delight of tagines and in fact many of the flavours and textures of Moroccan cuisine in general. 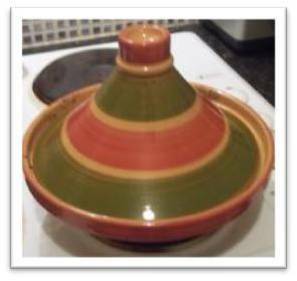 The conical shape of the tagine lid is designed to act as a condenser for the steam generated by the cooking. This means you can slowly casserole meat, poultry or fish with vegetables, spices and sumptuous fruits like figs, dates, lemons and apricots using very little added water. The result is a flavoursome and spicy - but not too ‘chilli hot’ - fruity dish with a pleasantly dry texture. A very important Moroccan flavour component is the Chermoula paste used as a marinade before cooking the chicken in the tagine. When ready, sauté the chicken pieces to colour in a large frying pan, allowing space between piece so each has chance to brown rather than steam. Add a little chicken stock, but not enough to bubble over during the cooking. Remember that the tagine is designed to condense the steam from the cooking liquid and so it should not boil dry. Keep a watch on it just in case though, especially if you leave it cooking for a long time. Cooking time is a minimum of one hour, but the tagine could be left on a low heat after that so there is no rush if you are serving it at a dinner party. The menu I learned recommended serving well-flavoured cous cous with the tagine – and there are many recipes available for this to suit a wide variety of tastes. The internet has many tagine recipes and indeed Moroccan starters and accompanying dishes. They all seem quite straightforward, but, it takes a little experimentation with the many spices involved to get the flavour you want - so the key seems to be to add a little of each at a time. Overall, I feel that my first experiences at cookery school were very pleasant as a holiday which I would thoroughly recommend to anyone interested in cookery – and – I have learned a lot that I can continue to use in cooking for family and friends. *The two schools were: Ashburton in the Dartmoor National Park in the south of England and LucyCooks in Staveley which is in the English Lake District. Both schools are in beautiful parts of England and so would form a convenient part of a touring holiday. The tagine recipe described above was from LucyCooks.